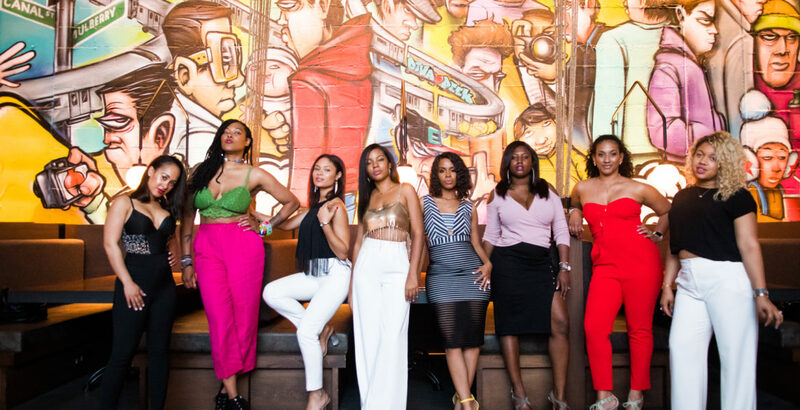 The ladies of HiiPizza celebrated a very important event the other day, it was Deneé’s birthday and each and every year the ladies always makes this a day not to miss and walk the city of New York in their bloody shoes. For those those that do not know, HiiPizza are a group of intellectual and sophisticated women who are also very close friends who have come to share their stories through their blog telling stories of their love life, their travels, and sharing their family experiences with the pains of growing up. On the outside many see them as these fabulous women that just can’t be approached because they are beautiful and very intelligent, but truly they are just regular ladies looking to have a good time with good friends willing to offer some good laughter and advice to any who would listen. The evening was spent at Rice & Gold, an Asian spot at 50 Bowery hotel in NYC that focuses on upscale dim sum, eclectic shareable plates and rice and noodle dishes for dinner, with a mix of dumplings, omelets and bagels. The ladies are always looking for a new and eclectic spot that always yields the best pictures for their life time stories. The evening was spent talking about scandalous gossip, catching up on the times, and beauty advice. But the evening was topped off with an array of desserts to celebrate Miss Deneé’s birthday with a sparkler to light up the moment. It was night to be celebrated and the ladies of HiiPizza enjoyed the night well.